Finished! The Up From Here baby quilt is complete. Some things I might do differently next time, but overall, quite happy with how this one came out. Definitely worthy of being given as a baby gift. And, other than finishing up the one that was already started, I don’t think I’ll ever be hand stitching binding again. Thank you to the folks at Cluck, Cluck Sew! The mini Fair Isle quilt needs to have the binding finished. The (No) Golden Shadows quilt needs to be basted, quilted and bound. 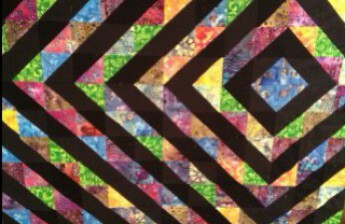 The Modern Block of the Month needs to have the blocks pieced together (w or w/o sashing??? ), and then basted, quilted and bound. A memory quilt for my son’s best friend who is moving in June. And of course, I’ve already got some other things picked out!